Well, the title might be a bit misleading because with over 20,000 photos of Bali, I probably have a plethora of my favourite photos. BUT, I do love this photo. It’s one of those pictures that conjures up many happy memories – over a course of 30 years of travelling to and exploring the magical island of Bali. One thing that you will always enjoy in Bali are peaceful, quiet moments that will allow you to let your mind relax and release any stress that you might be holding on to. 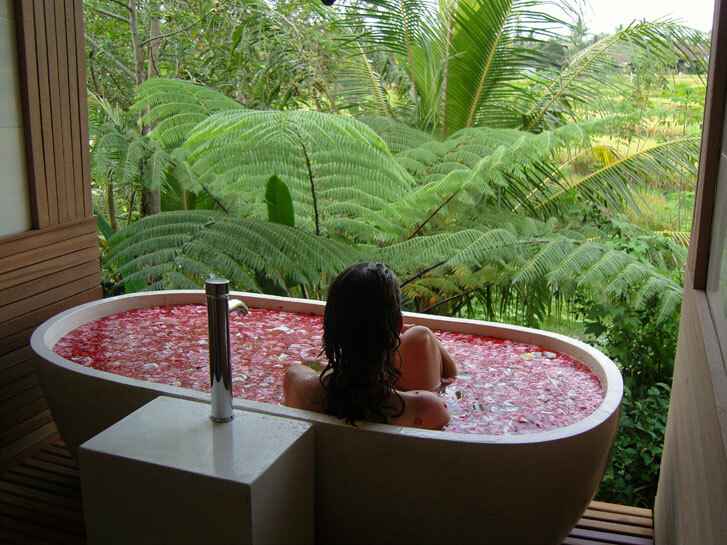 Having a bath in Bali is a luxurious way to spend a few hours, especially if you are surrounded by Mother Nature. In Bali this means gazing out over emerald green rice terraces and watching the ducks waddle through ‘their’ fields. You are often served home made ginger tea and lovingly carved local fruit. This bathtub is located in the beautiful spa at the Kumara Sakti Hotel, where I have been taking my Babes in Bali groups for 7 years. This gorgeous retreat hotel knows a thing or 2 about spas and have a great complement of spa therapists, who welcome us with open arms. So imagine relaxing in this bathtub – even if you can’t be there. We are travelling from Toronto and just wondering if there are any airlines you would recommend?